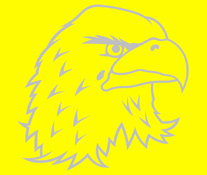 GYMARX is a computer generated vinyl adhesive masking material. 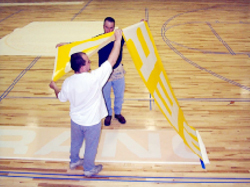 The letters, logo, or mascot are cut & removed from the adhesive backed vinyl and a thin paper tape is applied over it to keep all parts of the copy in registration. The entire line of copy is cut preregistered so there is no need to position one letter at a time. 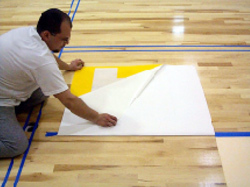 There are two techniques to apply GYMARX to a floor—The safe technique and the fast technique. If you've never applied the product, we recommend using the safe technique. Once you're comfortable using GYMARX, the faster technique may save you some time. First cut both edges of the GYMARX with scissors. 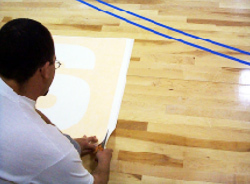 Position the masking on the floor by measuring from a straight letter, not the edge of the masking or transfer tape. 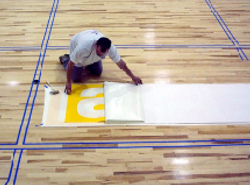 Once it is positioned, tape all four corners to the floor in the order that they are shown in photo. Put slight tension outward as you pull to the floor to remove any wrinkles. A temporary hinge is made across the top of the entire length of the masking with a good quality 2" masking tape. After applying the hinge, remove the four pieces of tape in the four corners. Cut vertically between each letter. This will allow you to safely position one letter at a time. Hinge masking up, remove the wax paper liner and lay it back down slowly putting slight tension on it to remove any wrinkles. 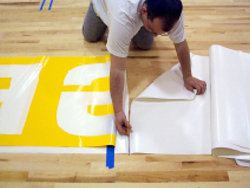 Squeegee or roll to adhere masking to the floor, remove paper transfer tape and paint. 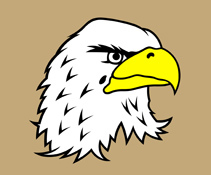 After the painting is completed, carefully remove the GYMARX. 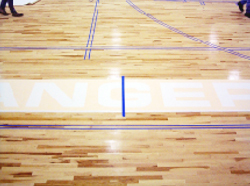 Do not let the paint completely dry on masking before removing it or it may pull away from the floor. After you have used and are more comfortable using GYMARX, explore one of the following application techniques. Follow the instructions given above for positioning and taping the four corners, but instead of a long horizontal hinge, make one vertical hinge in the center of the GYMARX. Remove the tape from the two corners and fold half of the masking back on the other half. Remove waxed liner up to taped hinge. Cut with scissors and discard. 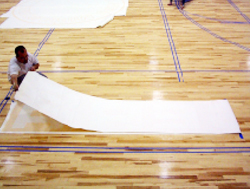 With two people, one on each side of the masking, fold masking back to its original position but hold it up off the floor. 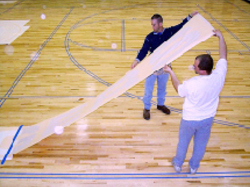 After it is back to the starting position, let one person hold the GYMARX up as the second person rolls or squeegees from the tape hinge towards the first person. 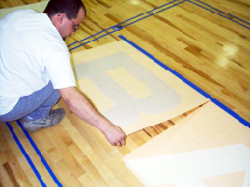 The second person slowly lowers the masking to the floor, keeping slight tension on it to avoid wrinkles. Remove the tape hinge and repeat the procedure on the second half. 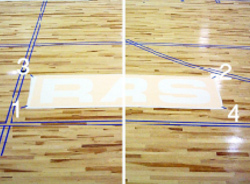 After it is applied, remove the transfer tape and paint! Multi-colored jobs are obtained by a two-part mask. Mask #1 is applied with all necessary areas removed that are to be colored. 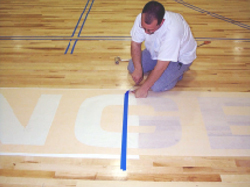 After all of the colors are painted, remove the masking and let the paint completely dry. 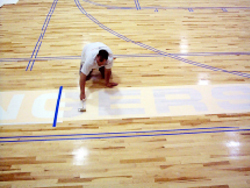 After the colors have dried, scuff the entire area, especially the sharp edges. Mask #2 is then applied on top of the first mask, overlapping about 1/8" (Depending on the size of the art). 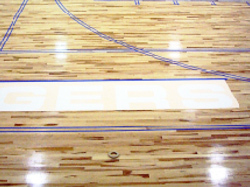 Paint the second color and remove the masking. 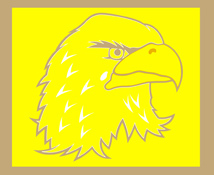 This is the result after painting the colors then removing Mask #1. 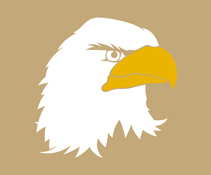 The brown square represents the floor. This view shows the second mask layed on top of the painted colors from the first mask. Notice the small overlap. Paint the areas that are removed black. Final result after mask #2 is removed. This product was made mainly for oil based paints, although very satisfactory results can be obtained with water based paints as well. For oil based paints, simply scuff the area to be painted. 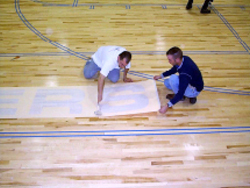 Roll or brush the open areas of the masking. Remove the GYMARX before the paint has fully dried. (If not it may adhere to the masking and pull from the floor in small areas). With water based paints, scuff the area to be painted and apply a very light coat (almost dry). Let dry, and then apply another coat. 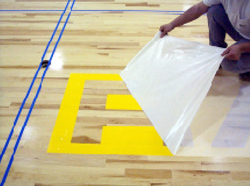 The first light coat seals the edges of the masking and reduces bleeds, which occur much more often with water based paints. 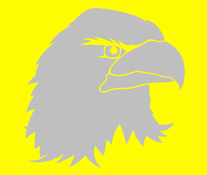 A two-colored letter job, such as a shadow or outline, can be done with a single mask if a void is left between the two. More care must be taken when painting, but GYMARX costs are reduced in half. Try using a 3" or 4" foam roller to any area large enough, then with a wet brush go over what was just rolled to let the paint lay down as smooth if it were sprayed. 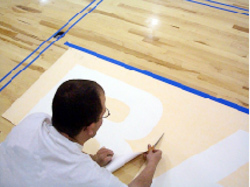 When dealing with a color that covers poorly, try using a blockout white primer first. 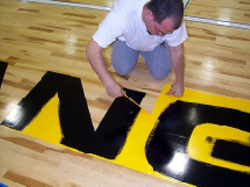 It dries fast enough to be top coated within an hour (in most cases) and will not bond to the masking when removed. 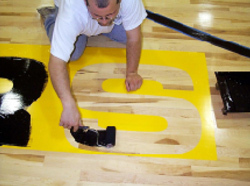 Make sure a sealer, a topcoat of finish, or paint is applied to floor before using GYMARX. Bare wood will bleed.